Progressive Retinal Atrophy is the most newly discovered of the heritable disease our responsible breeders are able to test for using the lab at the University of California, Davis (https://www.vgl.ucdavis.edu/services/cat/). Breeders commonly call it PRA or PRA testing. Progressive Retinal Atrophy is a disease of the retina where the photoreceptors referred to as rods and cones, enable a cat to see in the dark begin to deteriorate. These rods and cones develop early in a kitten’s life. As the cat gets older, these rods and cones begin to deteriorate. What you have then, is a cat with no sight at all, usually by the time the cat is around 5 years old. Cat eyes, work very much like human eyes and animals can develop many of the same eye maladies humans develop. The eye is constantly adjusting to the amount of light it lets in. The white of the eye is the sclera. This is the relatively tough outer layer of the eye. The conjunctiva, located near the front of the eye is a thin membrane that covers the sclera. The conjunctiva runs to the edge of the cornea and covers the inside of the eyelid. The cornea is a clear dome on the front surface of the eye that lets light in. 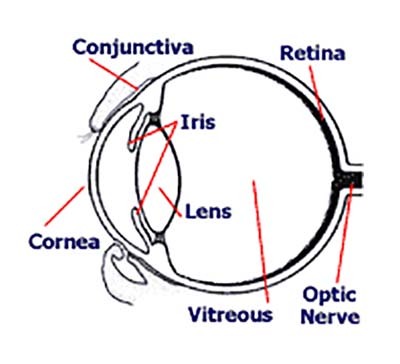 The cornea not only protects the front of the eye but also helps focus light on the retina at the back of the eye. The iris is the circular, colored area of the eye. It controls the amount of light that enters the eye by making the pupil larger or smaller. The pupil is the black area in the middle of the eye. The sphincter muscle controls the pupil. When the environment is dark, the pupil enlarges to let in more light; when the environment is bright, the pupil becomes smaller to let in less light. The lens, which sits behind the iris, changes its shape to focus light onto the retina. Small muscles contract to cause the lens to become thicker, which allows the lens to focus on nearby objects. In cats, these lens changes appear limited. The ciliary muscles relax to cause the lens to become thinner when it focuses on distant objects. The retina, at the back of the eye, contains the cells that sense light (photoreceptors). The 2 main types of photoreceptors are cones and rods. Cone cells give cats excellent visual acuity and binocular vision, allowing them to judge speed and distance very well, an ability that helped them survive as hunters. However, although the cone cells are also responsible for color vision, it is uncertain whether cats can see colors. Cats also have many rod cells, which are good at collecting dim light. In fact, cats can see 6 times better in dim light than people, giving rise to the myth that cats can see in the dark. Cats also have a reflective layer called the tapetum lucidum, which magnifies incoming light and lends a characteristic blue or greenish glint to their eyes at night. These are the cells that deteriorate in PRA, causing eventual, complete and total blindness eventually. As you can see Progressive Retinal Atrophy is not a disease that we, as responsible breeders, want to perpetuate in the Savannah cat. There is a simple test, quite like the test for PK Deficiency and at the same lab that many responsible breeders perform on their breeding cats so as not to proliferate this disease in our cats. There are two forms of PRA. Once is CEP 290 and the other is CRX PRA. A Savannah cat should be tested for both forms and testing information and results may be seen at: https://www.vgl.ucdavis.edu/services/cat/pra.php. As in PK Def carriers and affected cats should not be bred.